Cause for Celebration: Roulades! | Delicious! Delicious! Caryn carefully cuts through a golden chicken breast rolled with basil and goat cheese peeking out the seam. She neatly plates each spiral slice atop a silky, light-brown cream sauce and steps back to examine the dish. Mr. R., Lauren and Miss A. are assembled again around the long table dressed for an elegant dinner. They are joined by Miss A.’s friends. Caryn serves the plates as Lauren finishes pouring the wine. Lauren holds up a glass. Well, here’s to a fantastic new endeavor! Miss A. enthusiastically lifts her glass. To our best movie yet! Caryn looks up from serving, unable to hide her surprise at the news, but no one seems to notice. Mr. R. lifts his glass to the others, forcing an almost believable smile. The dinner guests sip the wine and take their forks to the roulades. Caryn refreshes water glasses. I think it’s going to be a long shoot. Too bad you won’t be able to take your chef with you. Mr. R. swirls some wine in his mouth, watching Caryn leave the room. This entry was designed for the Paper Chef #5 using the following ingredients: goat cheese, sherry vinegar, prosciutto and green garlic. This sauce is nicely tart and would work well with a variety of roasted meats. Inspirations: a cider cream sauce in The Gourmet Cookbook and Emeril‘s skillet-to-oven technique. 1. For the sauce, melt butter in heavy saucepan over medium-low heat. Add garlic and cook until tender, about 2 minutes. Add sherry vinegar, bring to a boil and boil until reduced by half, 5-7 minutes. Add chicken broth and boil until mixture is reduced by half, about 12-15 minutes. Add cream and boil until thickened slightly, about 10 minutes. Set aside to thicken. 2. Preheat oven to 325 degrees. 3. Place chicken breasts between two sheets of plastic wrap and pound to a 1/4″ thickness. Turn breast to smooth side down. Season top with salt and pepper. Cover breasts with a single layer of prosciutto. Crumble goat cheese evenly over prosciutto. Top with a single layer of basil leaves. Tightly roll up chicken breasts to pointed edge. Secure with toothpicks. 4. Heat oil and butter in large, ovenproof skillet. Add chicken and lightly brown on all sides, 3 minutes total. Place skillet in oven until cooked through, 15 minutes. 5. Remove chicken from oven and remove toothpicks. Let stand 5 minutes. Slice into 4 equal slices. Serve slices on top of sauce on individual plates. I got your link from Clotilde’s email list, and oh my god, I have to link your site right away. Your site was the best use of my work time all week! I really like the screenplay structure, it’s very original and the food looks gorgeous. Good luck with everything. Sepra, why use work time for anything else than food blogging? Thanks so much for the link. I’ll try to keep you entertained. And as far as those photographs go, Rachael, I still have a lot to learn, but I appreciate the encouragement. That’s what I say! If you can’t look up recipes at work, what can you do? Wow, that looks fantastic! Thanks for the tip on the Cypress Grove Chevre! Danno (and anyone else for that matter! ), pleeeeaaaaase try the Cypress Grove Chevre. I swear by it. Their cheeses mean so much to me, I’m considering a trip to Arcata! I made this last night – 3 words, well, okay 5. I have already passed this on to 2 people! thanks! It’s the breakfast hour but after seeing your gorgeous and scrumptious-looking roulades, I’m craving dinner. And what am I craving for dinner? Well let’s just say I’m on my way to the market to buy goat cheese, chicken, and basil leaves. Juliette, Hey, substitute away!! Can I suggest using spinach or arugula instead of basil? Also, the sauce could stand up to a number of vinegars…cider, sherry, red wine. You may also add a little something sweet to the sauce if it’s too tart. Thanks for the feedback. SO glad to see that you tried the Cypress Grove chevre! PJ, I think you’ll find it to be an easy recipe to put together after work. Hope they turn out well for you. Caryn, I made these last night and my husband LOVED them! My substitutions: Didn’t have cream; so I used 1/2 n 1/2; my sauce CURDLED almost instantly due to cooking sherry/red wine vinegar combo! Boo hoo! (I should have known better! The milk… duh!) Oh well, we are trying to be on a diet anyway, so the sauce went into the sink. I used Madame-Chevre goat cheese from TJ’s and some of their thin-sliced prociutto and fresh basil. The taste was exquisite. Can’t wait to try this on company! 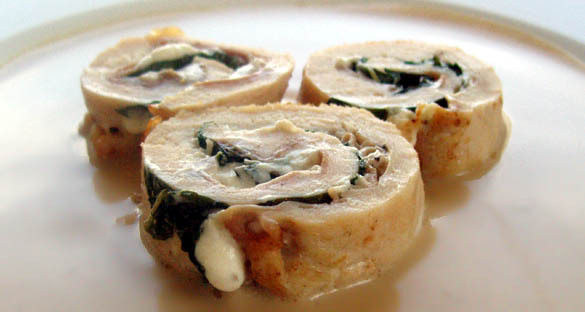 Rolling was tricky–will leave a little chicken sticking out at the end to skewer next time. Thanks!! Allisa, I never thought about the possibility of half and half curdling. Perhaps you could use it if you used less vinegar and allowed the mixture to cool slightly before adding the cream…and then just simmering…because I think that boiling half and half will also cause it to curdle. Anyway, sorry to hear about that. I’m glad that you like the roulades, though. My first visit and your site is perfect – not too much but enough. I love your scenes AND my mouth waters at the end of each. Regarding this recipe, I’m dying to try some champagne vinegar . . .